After a short sail from Kasterlorizo, we checked into Kas Marina and got them to organize our entry through their local agent. This was new territory for Dee and it was good to show her one of my favourite towns. 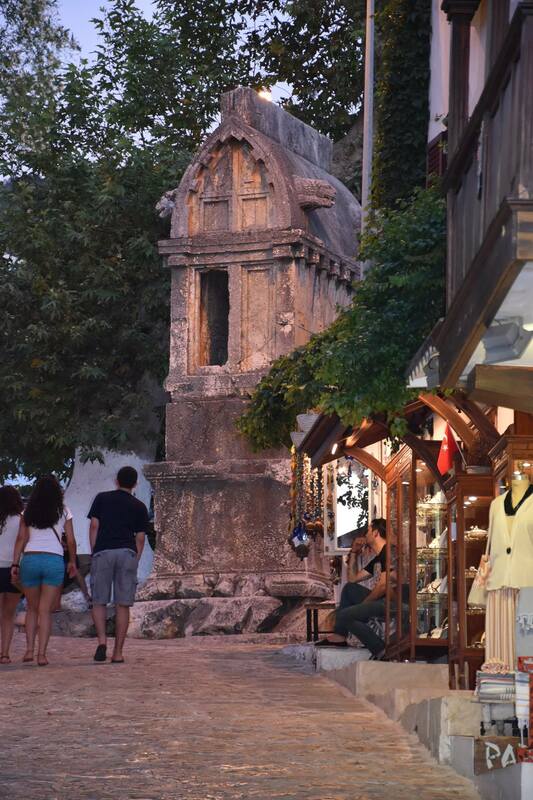 Kas comes alive at night and it’s a great place to window shop. After dinner, we headed to the town harbour and who should we bump into but Ali Baba 10, the gullet we attached ourself to last year, when Ewa was onboard. Mutlu, the owner was in expansion mode, having just bought another gullet and a bar. His previous first mate was now captain and after showing Dee around the insides of a gullet, we took off to find Mutlu at his new bar, Mumi’s. Mutlu was his same generous self as he shouted us drinks and we had a great chat, promising to return. Next day it was time to head West towards Gocek where we were picking up Toma and Randy. We did the usual stop in Kalkan and St Nicholas Island before calling into Fethiye to get our solar panel fixed and some new sunshades made up. We found someone in the marina selling the exact same solar panel and decided to put a couple more on at the same time. My batteries were on their last legs and I figured they could do with any help they could get. That turned out to be a mistake as the guy had no idea what he was doing. On the plus side, we found a really good canvas guy and we now have a lovely set of new shades for both front and back. Well needed as August was very hot. Next stop was Gocek and we found a really good guy called Sanli from ModaYacht to fix our panels. He came recommended and the recommendation was spot on. He became my go to guy to get any work done. Given the upcoming events, this proved to be very fortunous. Gocek was where we picked up Randy and Toma and after we had got them settled on the boat, it was time to get back into cruising and exploring mode. This entry was posted in Turkey and tagged Gocek, Kas, modayacht, mutlu by stull61. Bookmark the permalink.